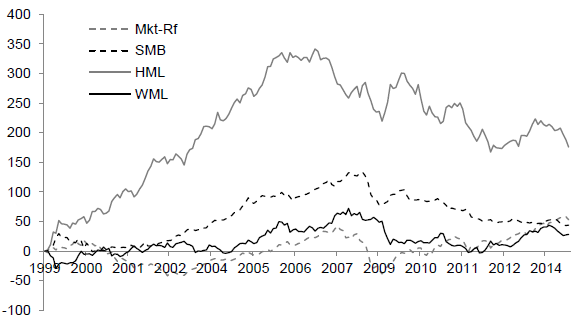 Factor Model of Country Stock Market Returns? Value: aggregate book-to-market ratio, with aggregate 12-month earnings-to-price-ratio, cash flow-to-price ratio and dividend yield as alternatives where available. Size: total market capitalization of country stocks. Momentum: cumulative return over preceding 12, 9, 6 or 3 months excluding the last month to avoid short-term reversal. Based on portfolio returns over the entire sample period, stock markets that are small, have low valuation ratios and good past performances tend to outperform those that are large, have high valuation ratios and poor past performance, respectively. However, the momentum effect is relatively weak and not statistically significant. 0.40% for value based on book-to-market ratio, and stronger returns for other valuation metrics (dividend yield is strongest at 0.74%). 0.28% for momentum based on 12-month past returns, and a stronger return for 9-month past returns at 0.38% (but weaker for 6-month past returns and practically nil for 3-month past returns). The country-level value and momentum effects are stronger among small and medium-sized country markets than among large ones. However, effects are not consistently stronger among small markets than among medium-sized markets. Equal-weighted quintile (long only) portfolios generally outperform corresponding value-weighted portfolios, but carry higher risk. Equal-weighted hedge (long-short) portfolios sometimes outperform and sometimes underperform value-weighted versions. 0.34% for the market excess return (Mkt-Rf). 0.61% for High-Minus-Low (HML) based on book-to-market ratio (the only statistically significant factor). 0.23% for Winners-Minus-Losers (WML) based on past 12-month returns. However, factor returns fade or even reverse after 2007 (see the chart below). The sample of countries is not large, and the sample period is short. Finally, the study does not take into account local trading frictions/liquidity constraints and tax rates. The following chart, taken from the paper, depicts cumulative gross percentage returns on country-level factor (long-short) portfolios over the sample period. While profitable overall, the value, size and momentum factor portfolios are unprofitable after about the first half of the sample period, undermining belief in reliable factor premiums at the country stock market level. In summary, evidence suggests that value, size and momentum premiums may exist in country stock market returns, but the fact that these premiums go missing or reverse over the last half of the sample period undermines belief in them and would have defied recent exploitation of them. As noted, all return calculations are gross, not net. Including the costs of monthly factor portfolio reformation would reduce reported returns. Different factors may generate different portfolio turnovers, and trading frictions may vary by country. Hedge portfolio calculations ignore costs/feasibility of shorting country indexes. Use of funds as proxies for country indexes would involve fees for maintaining liquidity. Calculating value and size at the country level is infeasible for many investors (and costly if delegated). As noted, the sample period is short relative to the measurement intervals for some factors, and especially in terms of variety of worldwide economic conditions. Testing of multiple factors/combinations of factors on the same set of data introduces data snooping bias, such that the best performing factor/combination tends to overstate expectations. See also the closely related “Stock Markets Have Value and Size, Too?” and “Big Three Factors across Countries”. Consider also the P/E10 approach to country stock market valuation in “Trading Country Stock Markets Based on Relative P/E10” and “P/E10s Worldwide in 2014”.